At Gang Warily we can accommodate a wide range of events either inside or out. 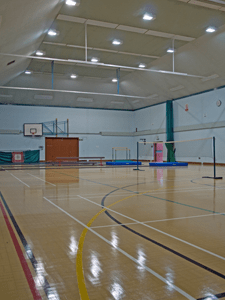 Main Sports Hall – As well as catering for the recreational activities this hall is available to hire for bigger functions, trade shows, exhibitions and parties. A large adaptable space, the main hall can accommodate up to 500 people in a variety of setup styles. The hall can also be split into 4 sections so you can rent the hall sections, if need be. 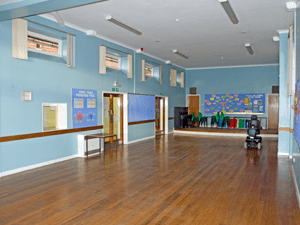 The GA room (General Activity) – this recently refurbished room is a multipurpose room suitable for small training courses, meetings and children’s parties. The room will accommodate up to 40 people theatre style. Licensed Bar – Also on site is a fully licensed bar, this room can be used for quiz nights, race nights, or parties. The bar is open weeknights and weekends. 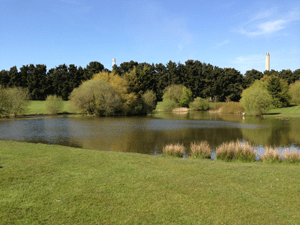 Gang Warily Recreation and Community Centre sits in 50 acres of beautiful and varied landscape. All of our space can be hired for special events. To date we have hired space for fete’s, football tournaments, running races, hovercraft racing, dog shows, markets, craft shows, motor car rallies and many more. We also have a range of equipment that can help your event including tables, chairs, marquees, bouncy castles, fencing etc. Situated in the heart of Fawley this building is the traditional administrative heart of the Parish. There are two rooms available for hire that can be used for functions, theatre productions, meetings and even band rehearsals. The rooms are available seven days a week and the hall is licensed for the consumption of alcohol. Kitchen facilities are available for the preparation of hot or cold food and drinks. There is also ample parking on site. For further details and prices please contact Jubilee Hall on 023 8089 1640. The pavilion is the newest building owned by the parish. Managed by the staff at Gang Warily it is used to accommodate a large variety of sports and functions. Outdoor Space – The Pavilion sits in 11 acres of sports fields used for football and cricket. This space can be hired for all types of events including summer fetes, running races etc. Caravan Rallies – We have an area of 4 acres overlooking the lake which is designated for caravan rallies. This also allows anyone hosting a particular event to be able to stay overnight on site. This includes a water point and waste disposal. All shower, toilet and changing facilities are based in the centre.